Aurora & Toronto Both Trying to Muzzle Their Critics! Spotted a half page article (Pg 17) in the June 4th Toronto Sun (Note to Banner and Auroran — the newspapers in that community are reporting on this issue!). Sue Ann Levy reports that Toronto Council Executive Committee has passed a policy that would allow Councillors to launch lawsuits against another Councillor or a third party (i.e. media or the public). It goes to Council as a whole July 6. Seems more that just our Mayor is unwilling to allow free speech in their community. Sue Ann refers to “Communist City Hall”. However, at least in Toronto, “an independent external lawyer specializing in libel and defamation will be engaged to determine the merits of the claim before it is deemed eligible”. Furthermore, it seems that Council will debate this new policy in public. Aurora Council seems to feel neither are required. There has been no public discussion (possibly discussed privately???) and no checks and balances appear to be in place. The Mayor is upset — so the CAO has started to take action on her behalf. Open and transparent? We think not. Maybe our local politicians should spend less time and money trying to muzzle their constituents and more time listening to them. 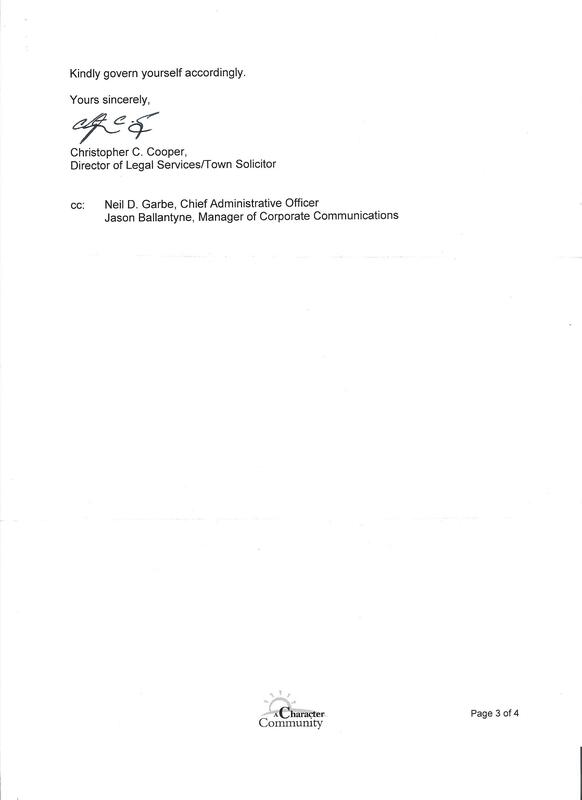 The following email was received from Neil Garbe, CAO of the Town of Aurora Monday June 1. It is posted unedited in its entirety. This is the second request — the original was sent May 29. 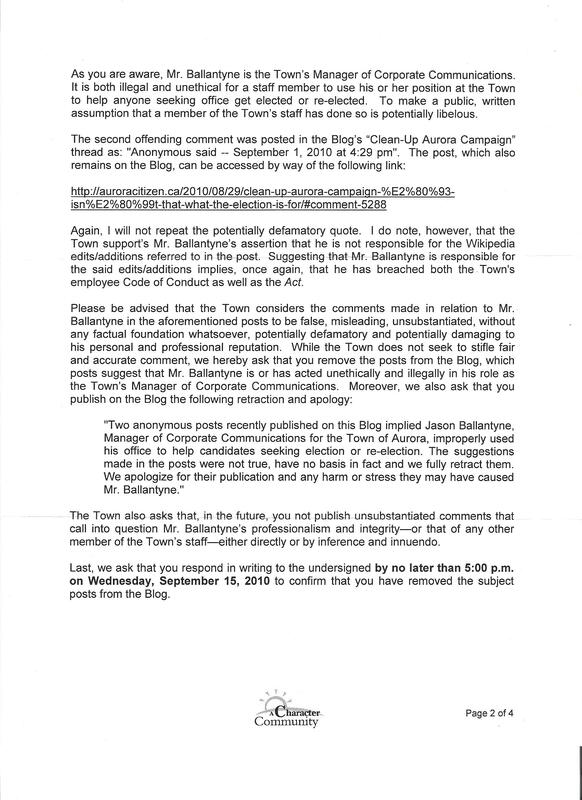 I note that as of June 1, 2009 5:00 p.m. the comment of an individual under the pseudonym “New_Man_In_Town” is still posted on this site that alleges criminal wrong-doing on the part of the Corporation of the Town of Aurora. I am reiterating my request that the moderator of the Aurora Citizen immediately remove the comment, apologize for its inclusion on the site and contact “New_Man_in_Town” and solicit a retraction and apology from that individual. I feel it is a reasonable expectation to fulfill this request by 5:00 p.m. on June 2, 2009. The following email was received from Neil Garbe, CAO of the Town of Aurora at 4:46 pm Friday May 29. It is posted unedited in its entirety. 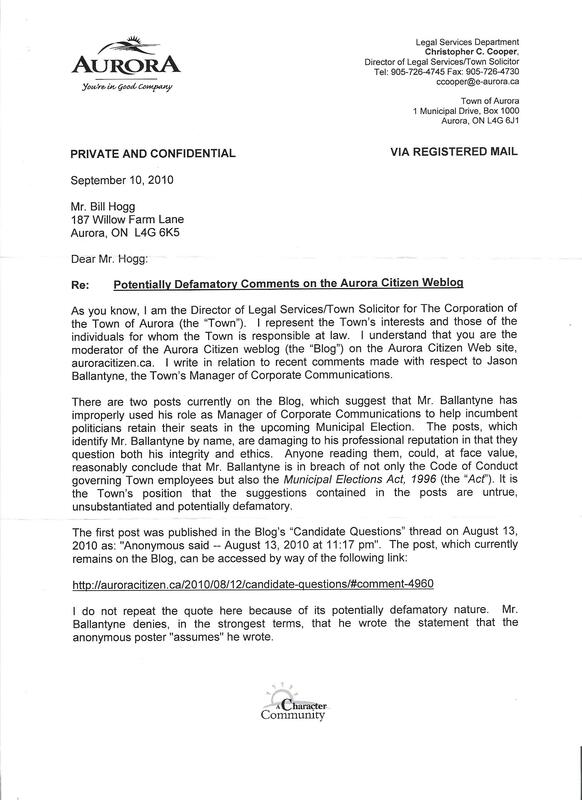 He was not specific which post by New_Man_in_Town was being referenced, but we have reviewed the 4 posted and cannot find a post that “alleges criminal wrong-doing on the part of The Corporation of the Town of Aurora”. However, we did find a comment on Wed 5/27 under What’s up with the May 12 Council Minutes that referenced the Mayor. As our readers and contributors are aware, anonymous posts are just that — anonymous — and we are unaware of the identity of these contributors. Similarly they are aware of our Editorial Policy & Legal Notice which is prominently displayed on the right side of the blog. I am requesting that the moderator of the Aurora Citizen immediately remove the comment and apologize for its inclusion on the site. I am also requesting that the moderator contact “New_Man_in_Town” and solicit a retraction and apology from that individual. Please be advised that such statement will not be tolerated and the Town will be taking all actions that may be required to identify the individuals involved in order to protect the Town and those for whom it is responsible. Aurora will welcome a new CAO in January. Neil Garbe is currently at the Region, so he should be fully aware of the situation here in Aurora. His first job should be to start rebuilding trust in the ranks of the Town staff. In the current economic climate, hardly a day passes without the newspapers commenting about the importance of motivated staff to achieve the best results. Countless research studies have shown that unless staff is positive about their jobs they do not perform effectively. Why is that important? Until that is achieved, the residents will never receive their full value of their tax dollars. In other words, our taxes are higher because the town does not operate as efficiently as possible. One example is the amount of time and money that gets spent by Council’s inability to make a decision about issues and continually revisit them. The waste in staff hours and impact on moral must be staggering. The current Council needs to ensure that our scarce dollars derive the most benefit and the first steps is to rebuild relationships with staff. We will all be watching with great interest to see how he manages the situation he has inherited. Now that Council has hired their Integrity Commissioner, it will be interesting to watch how they are utilized. There have been a number of accusation made about integrity that would be worthy of consideration. There has been the refusal to sign the Code of Conduct by Cllr. Buck, and possibly some citizen members. Is it even appropriate to force citizen members to sign? Or the Conflict of Interest accusations around the appointment of Ken Whitehurst? Or even the dismissal of the CAO? Will the new position be used as a weapon to try to quiet dissenting opinions? Will it be used for a little self-evaluation of their own conduct? Most importantly, will this third party be able to render third party opinions without having to vet them through Council under the cloak of “In Camera” meetings because of the personnel nature of the issues? How broad or narrow will the scope be? Remember, they are not full-time. Will they only be used at the discretion of Council, or will citizens have the ability to contact the Commissioner to investigate and report on the behaviours of Council or specific members? All of these are important questions that need to be answered. Stay tuned, I am sure that activities will shortly start to tell the story. Update: Where have all the town staff gone? Since our original post last week on this subject, we have received a number of comments. Obviously it is an area of concern to many Aurorans so we thought we would update everyone on some of these comments. It seems we were incomplete in our list of town staff who have left under this new Council. In addition to the 5 Directors, we have also lost the Mayor’s administrative assistant, Cookie Ellis — who was subsequently replaced by both a Mayor’s administrative assistant and a new position this term of an assistant for our part-time Council. What she does for 5 days each week when Councillors are at their full-time jobs is beyond my scope of understanding. Possibly even more troubling is that we have already lost 2 of the replacements. It seems both our interim Solicitor Robert Cambridge and the Acting Director of Public Works Dave Atkins have already left. One must wonder who will be next through the revolving door of town hall staff. One of our commenter’s stated that there is already a move afoot to jettison another Director. To see all comments from the original post click here. Where have all the Town Staff gone? Senior staff at the Town Hall are leaving at an alarming rate. Since our new Council started, under the much vaunted open and transparent leadership style of Mayor Phyllis Morris, we have lost our Director of Planning, Director of Legal Services, Director of Public Works, Director of Corporate Service (leaving this year), and now the CAO. That’s 5 of the 8 person Management Team. The years of experience lost are significant and the costs associated with recruitment, re-training and lost opportunities without these people in place is immeasurable. The termination costs will also be considerable given the CAO had over 3 years left in his contract. Of equal concern is the abrupt manner of the recent departure of the CAO, a well-respected member of the municipal community who the previous Council hired for a 6 year contract to provide consistent leadership for the town. It has been reported he was “escorted” from the building. What may be more telling is that two councillors were unable to participate in the decision as one was recuperating from surgery and one was on vacation. Given that Council was informed in advance that the two councillors would not be present, why did Council go forward so abruptly with a decision with such far-reaching implications without a full Council present? Why the urgency? Why not wait until all of Council could be present and a “special meeting” be called. The mayor has called 4 “emergency” closed session meetings this summer so far, what difference would one more make? The implication is clear — a swift decision was made and executed. The impact on staff morale should also be of great concern. One has to wonder if this is a purge or is there some staff-wide malaise that has caused all these departures. At this point, the only members of the Senior Management team from last term still standing are Al Downey, Director of Leisure Services and John Gutteridge, Director of Finance/Treasurer. I guess we will just have to await their fate. Maybe I’m the only one concerned about the state of affairs at town hall, let me know. Use the links below to comment or to send this post on to other interested Aurorans.